KENNEBUNKPORT, ME — Former President George H.W. Bush and First Lady Barbara Bush set sail last month with the crew of Impossible Dream, a unique catamaran designed for disabled sailors, a chance for the watermen and activists to thank the 41st President of the United States for signing the Americans with Disabilities Act (ADA) into law in the summer of 1990. The sailors were excited to be able to offer the president – a renowned boater – the opportunity to take the helm of this remarkable accessible vessel. The former president and First Lady boarded the Impossible Dream for a sail on the Atlantic Ocean. 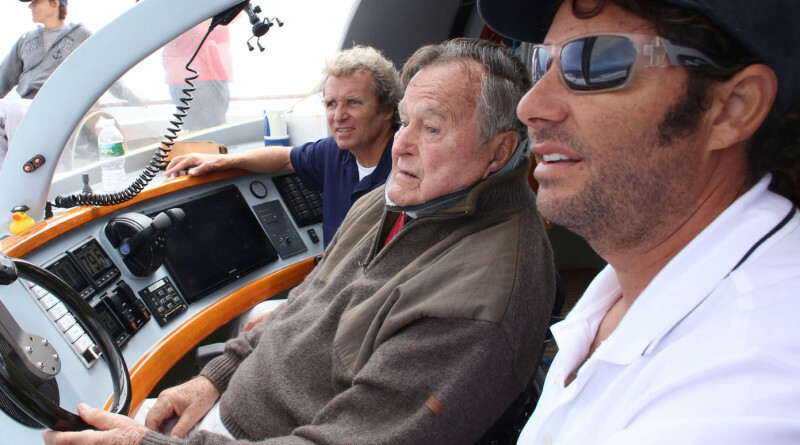 Bush, who at 91 often relies upon a wheelchair for mobility, piloted the watercraft for most of the trip and experienced the unique controls that make it fully operational by a person in a wheelchair. Impossible Dream, a 60-foot wheelchair accessible catamaran yacht, set sail from Miami, Florida this summer up the eastern seaboard in celebration of the 25th anniversary of the ADA. Along the way, the crew has taken over 400 wheelchair-bound children and adults and their families to enjoy a sail. The nonprofit Impossible Dream is based in Miami at the Shake-A-Leg Miami Community Water Sports Center, which for the past 25 years have been using the marine environment to improve the health, education and independence of people with disabilities and their families. The mission of the Impossible Dream is to engage the global community and inspire people with disabilities and their families to improve their independence and quality of life. For more information, visit impossibledream.us.